Did you ever look at something day after day and not really notice it, until one day it seems as though you're seeing it for the first time? Many radiology professionals probably feel that way about their work, as demonstrating value and incorporating AI become increasingly important. Change can be both frightening and liberating. Although there's quite a bit of uncertainty about what radiology will look like five or 10 years—or even one year—down the road, the current state of flux allows forward-thinking people to imagine new and better ways of serving patients, while maintaining radiology's place as an indispensable part of modern health care. 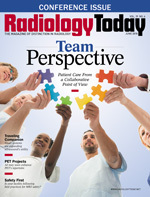 In this month's cover story, Kathy Hardy speaks with some of the aforementioned forward-thinking people to get their thoughts on how radiology can become more of a team player in patient care. Limiting radiology's scope of practice to interpreting images isn't going to be sufficient in the value-based care world, and radiologists will need to step outside of their comfort zones to keep pace. The radiologists whom Hardy talks with believe that radiology can best demonstrate value by being more responsive to the needs of referrers and collaborating with multiple departments to improve patient care. Another way to improve patient care is to meet patients where they are. Keith Loria examines the world of small and mobile ultrasound. Ultrasound's portability is one of its big advantages, but smaller systems, which are often handheld, offer utility beyond usual constraints. Although they don't offer as many options as premium systems, small systems may prove to be a useful tool for first responders and to quickly answer clinical questions that don't require a full exam. Efficiency and precision are also intertwined with patient care. Beth W. Orenstein takes a look at some ways that AI may soon be used to improve PET imaging. Although AI for PET is less developed than it is for other modalities, experts in the field believe it won't be long before AI algorithms are helping to better identify abnormalities, quantify tumor size and treatment response, and mine the currently underutilized trove of PET data for deeper clinical insights. Finally, we're taking a look at MRI safety. MRI is often thought of as a "safer" exam because it doesn't use ionizing radiation, but MRI scanners harness and direct a tremendous amount of energy from multiple sources. Inadequate safety protocols can and have resulted in tragic accidents. We speak with some of the preeminent MRI safety advocates to find out how facilities should be handling MRI safety.